The CA5 Series contactors have a large horsepower performance and are designed 40 % smaller than a traditional contactor of its rating. This line provides easy inspection, contact replacement and coil change out. 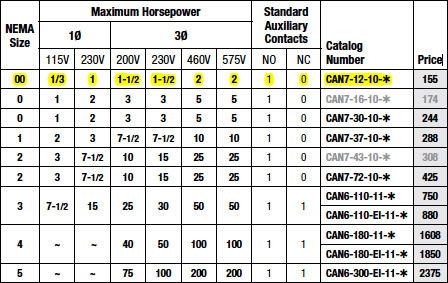 The CA5 Series includes of four contactors in two frame sizes covering motors from 500 to 900 HP at 460V/575V. The CA5 Series is applicable for utilizing large machinery and equipment such as rock quarries and mines or large horsepower applications. The CA7 Series contactor features mechanically linked contacts to ensure the auxiliary contacts don’t change state when coil power is removed and the device tries to open. The CA7 is flexible power contactor that is designed to meet the highest industrial requirements. The CAL7 Series lighting contactors are designed for a wide variety of lighting loads. This series is best for suiting high inrush currents and other non-motor (resistive) loads. Mechanical and electric held modules are available for lighting load application up to 20A, 30A and 60A. The CA8 Series of miniature contactors and starters can help provide an extreme compact method of controlling motors of 7.5 HP or less (@460V). CDP2 Series is designed for commercial applications including air conditioning, refrigeration, resistive heating and several other applications. These devices are applicable for electrical and mechanical requirements as defined by definite purpose contactor standards. CDP2 Series contactors consists of 1-4 pole contactors rated to 600V AC. The three pole devices range to 90A, 1-2 pole models are 40A rated and 4 pole models are available in 25A-40A ratings. NEMA contactors are UL Listed and rated in accordance with the requirements of NEMA standards publication ICS-2. These contactors are labeled for applications that require compliance with NEMA standards. Sizes are based on standard NEMA classifications. Available as open units or in NEMA 1, 3R, 4, 4X and 12 enclosures. * Referenced pages located in "Contactors Information" PDF link below.